Ensuring accountability on a commitment to comprehensive sexuality education for youth! UNESCO and UNAIDS in collaboration with UN and development partners, RECs and CSOs, religious and youth leaders led an initiative aimed at securing commitment from Education and Health ministers from 20 Eastern and Southern African countries to accelerate access to comprehensive sexuality education and health services for young people in the region. The initiative is a strategic tool that brings together Ministries of Education and Health to strengthen HIV prevention efforts and foster positive health outcomes by advocating for access to quality, comprehensive sexuality education as well as sexual and reproductive health services for young people in the ESA region. The historic ESA commitment was endorsed at the 2013 ICASA Conference and has time-bound actions and targets that were agreed upon by member states. 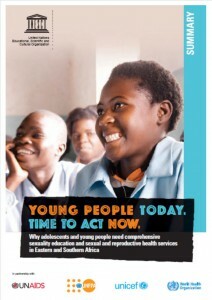 The ESA Ministerial Commitment is expected to pave the way for actions which scale up delivery of sexuality education and related health services, support joint action around developing programmes, sharing information, strengthening linkages and referrals between schools and health services and an overall approach which facilitates access and equity and strengthens national responses to HIV and SRH. Click here to see the project website. In 2012, AIDS Accountability International provided Guidelines for the United Nations on What Makes for a Better Commitment? for their Technical Working Group. Click here to read the Guidelines for the United Nations on What Makes for a Better Commitment? In 2013, AIDS Accountability International has played a leadership role in determining civil society's role in holding leader's acountable to this new commitment, and determining how this should occur. Click to read about our event at ICASA. Post ICASA 2013, AAI participated as a member of the Technical Working Group on the structure and content of the Accountability Framework. Read more about the Accountability Framework. In 2015, AAI also supported the development of a civil society engagement strategy. In July 2016, at the International AIDS Conference in Durban, UNFPA launched a report presenting the progress made after two years of implementation (2013-2015), and proves that with targeted interventions, sound strategies, adequate resources, and political will, the ESA Commitment targets are attainable. The data presented was obtained and validated through a multi-sectoral country reporting process as stipulated by the respective coordination mechanisms of the ESA Commitment. In November 2016 a meeting was held to develop a strategy for CSOs to engage on the ESA Commitment. A Technical Coordinating Group (TCG) meeting was convened on 17-19 May 2017 in Johannesburg, South Africa. The purpose of the expanded TCG meeting was to reflect on the ESA Commitment implementation across the ESA countries, discuss progress, challenges and priority areas for the required technical support. The meeting sought to highlight the role of civil society in the implementation, coordination and accountability at all levels. Represented at the meeting were participants from the 21 ESA countries, drawn from government, civil society, Regional Economic Communities (RECs) and development partners. Attached are the concept note for the TCG meeting and the presentations made by Civil Society Steering Committee. ▸ Satellite Session on Engaging Civil Society in the Eastern and Southern Africa (ESA) Ministerial Commitment to adolescents and young people’s needs and rights. A United Nations campaign to improve the lives of young people in Eastern and Southern Africa with sexuality education and health services. Your chance to influence change. Satellite Session on Engaging Civil Society in the Eastern and Southern Africa (ESA) Ministerial Commitment to adolescents and young people’s needs and rights. This campaign urges ministers of health and education in Eastern and Southern Africa (ESA) to act on UN recommendations that could improve the health, education and prosperity of over 158 million young people in the region. The more supporters this campaign can show, the more likely ministers in the region are to take urgent action. Right now in 21 countries across the ESA region, education and health ministers are meeting to discuss a range of bold actions that could dramatically improve the knowledge and health of millions of young people – while reducing the impact of broad challenges that young people face today. These challenges include high rates of HIV infection, unintended pregnancy, maternal death, gender-based violence and limited access to health services. Present and discuss the ESA Ministerial Commitment from a civil society perspective and to highlight the role of civil society in the implementation of the commitment to ensure positive health outcomes for young people through the ESA Commitment process. Agree on a Monitoring Framework to monitor the agreements and hold governments accountable for delivering on the commitment.